Check out this article about us in the Rockford Register Star! Here is a picture of our booth before an event (this one was taken at the Rockford City Market). 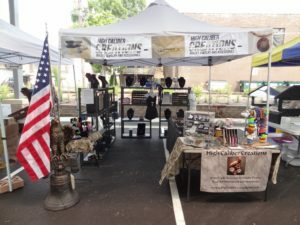 Clockwise from the eagle we have handmade paracord items, then on the shelves we have pistol round necklaces, revolver round necklaces, rifle necklaces, ammo-free necklaces, case head necklaces and Hog’s tooth necklaces. On the long table we have case head bracelets, case head rings, key chains, earrings, gauges, engraved cartridges and miscellaneous items. Starting on July 10, we will also have our bullet pens on this table. On the front table, we have our LED light up bracelets, our .50 Caliber BMG bottle openers and a case with our sterling silver and higher end items, including expanded hollow point necklaces and cuff links. COME SEE US and say hello! Mention this post for 10% off one item.